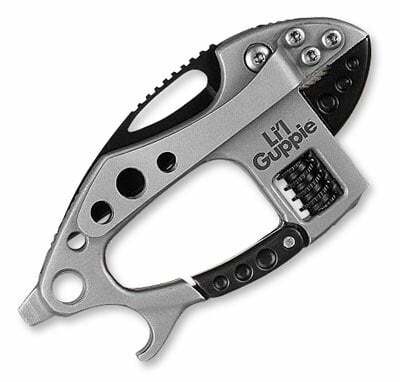 Here’s a useful gadget, the Lil Guppie Multi-tool. The adjustable wrench on the Lil Guppie Multi-tool opens to 10 mm so it can be used for light repairs and assembly jobs. 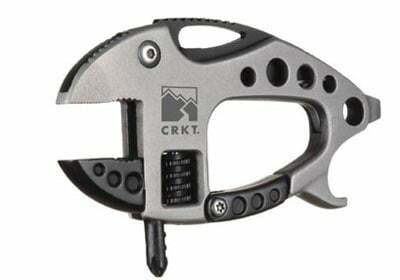 The carabiner is great for attaching to a D-ring, belt loop or backpack. The high-carbon stainless steel blade has a razor sharp edge and can be opened or closed with one hand. The tail of the Guppie is a flat blade screwdriver that can handle smaller size screws in a pinch and the base of the jaw is a Phillips screwdriver. The curved fin is a built-in bottle opener. The Guppie also comes with a detachable stainless steel pocket clip that makes a great money clip. The Lil Guppie Multi-tool is available to buy online for $19.99 from ThinkGeek.